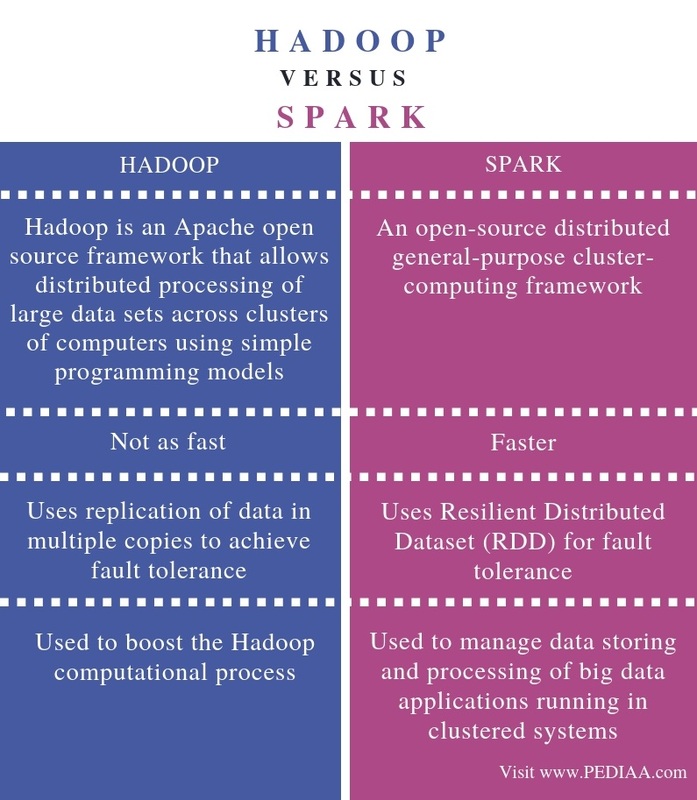 The main difference between Hadoop and Spark is that the Hadoop is an Apache open source framework that allows distributed processing of large data sets across clusters of computers using simple programming models while Spark is a cluster computing framework designed for fast Hadoop computation. Big data refers to the collection of data that has a massive volume, velocity and variety. Hence, it is not possible to use traditional data storing and processing methods to analyse big data. Hadoop is a software to store and handle big data effectively and efficiently. But, Spark, on the other hand, is an Apache framework to increase the computing speed of Hadoop. It can handle both batch and real-time analytics and data processing workloads. Hadoop is an open source framework developed by Apache Software Foundation. It is used to store big data in a distributed environment in order to process them simultaneously. Also, it provides distributed storage and computation across clusters of computers. Furthermore, there are four major components in Hadoop architecture. They are; Hadoop File Distributed System (HDFS), Hadoop MapReduce, Hadoop common and Hadoop YARN. HDFS is the Hadoop storage system. It works according to the master-slave architecture. The master node manages the file system metadata. The other computers work as the slave nodes or data nodes. Also, the data is divided among these data nodes. Likewise, the Hadoop MapReduce contains the algorithm to process data. Here, the master node runs map-reduce jobs on slave nodes. And, the slave node completes the tasks and sends the results back to the master node. Additionally, Hadoop Common provides Java libraries and utilities to support the other components. On the other hand, the Hadoop YARN performs cluster resource management and job scheduling. 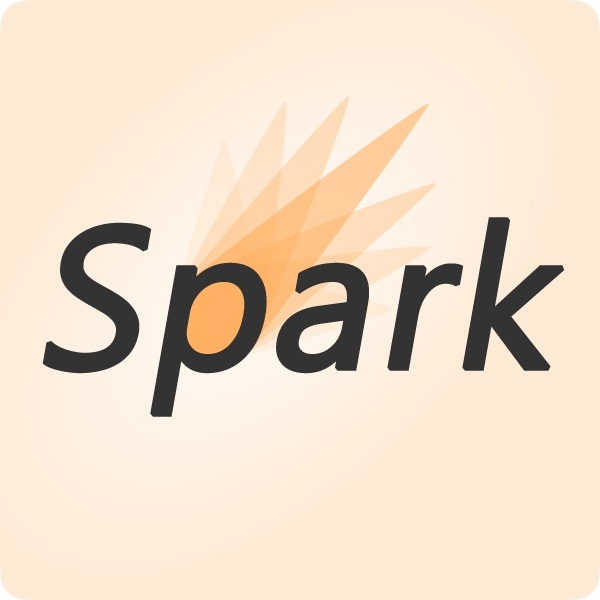 Spark is an Apache framework to increase the computing speed of Hadoop. It helps Hadoop to reduce the waiting time between queries and to minimize the waiting time to run the program. Spark SQL, Spark Streaming, MLib, GraphX and Apache Spark Core are the major components of Spark. Spark Core – All functionalities are built on Spark Core. It is the general execution engine for spark platform. It provides in-memory computing and referencing datasets in external storage systems. Spark SQL – Provides SchemaRDD that support structured and semi-structured data. Spark Streaming – Provides capabilities to perform streaming analytics. MLib – A distributed machine learning framework. Spark MLib is faster than Hadoop disk-based version of Apache Mahout. GraphX – A distributed graph processing framework. It provides an API for expressing graph computation that can model the user-defined graphs using Pregel abstraction API. Hadoop is an Apache open source framework that allows distributed processing of large data sets across clusters of computers using simple programming models. Apache Spark is an open-source distributed general-purpose cluster-computing framework. Thus, this explains the main difference between Hadoop and Spark. Speed is another difference between Hadoop and Spark. Spark performs faster than Hadoop. Hadoop uses replication of data in multiple copies to achieve fault tolerance. Spark uses Resilient Distributed Dataset (RDD) for fault tolerance. Another difference between Hadoop and Spark is that the Spark provides a variety of APIs that can be used with multiple data sources and languages. Also, they are more extensible than Hadoop APIs. Hadoop is used to manage data storing and processing of big data applications running in clustered systems. Spark is used to boost the Hadoop computational process. Hence, this is also an important difference between Hadoop and Spark. In conclusion, the difference between Hadoop and Spark is that the Hadoop is an Apache open source framework that allows distributed processing of large data sets across clusters of computers using simple programming models while Spark is a cluster computing framework, designed for fast Hadoop computation. Both can be used for applications based on predictive analytics, data mining, machine learning and many more. 1. “Hadoop – Introduction to Hadoop.” Www.tutorialspoint.com, Tutorials Point, Available here. 2. “Apache Spark Introduction.” Www.tutorialspoint.com, Tutorials Point, Available here.